Texas residents interested in pursuing a career in nursing should consider enrolling in one of the nursing schools in Austin. The people of Texas take great pride in their state, every aspect of it, including their educational institutions. Austin, Texas offers prospective students the opportunity to obtain a certificate or degree in nursing. Two nursing schools in Austin, Texas worth considering are the University of Texas at Austin and Austin Community College. In this article you will find reviews on both these nursing schools in Austin, along with recommendations on which one might be the best fit depending on your education goals. The biggest and most prestigious of all nursing schools in Austin is the University of Texas at Austin. This school has received national recognition for both their undergraduate and post graduate nursing programs. In fact, the University of Texas at Austin is one of eight nursing schools in Texas that were ranked in the top 100 nursing programs by US News and World Report. Students interested in earning their undergraduate degree, will find that the RN-BSN program is a popular option. It is for RNs who have already earned their Associates degree and who want to obtain their Bachelor degree. The University of Texas at Austin also offers a Bachelor of Science degree. This is an in-depth program that prepares students to either become a RN or continue their education. Graduates will be in a position to take their NCLEX-RN (National Council of Licensure Examination for Registered Nurses) exams upon finishing the Austin nursing program. There are two Master level courses at the University of Texas at Austin. They include the Alternate Entry Master of Science in Nursing and the Master of Science in Nursing. The former is for people who would like to get their Masters degree in nursing but who have an undergraduate degree in another field. Upon finishing the program, individuals will be able to obtain their AE MSN and take the NCLEX-RN exam. In addition to the Austin nursing school’s two master level programs, students will have the opportunity to enroll in two Doctorate programs, the Alternate Entry Doctor of Philosophy in Nursing (AE Ph.D.) and a Doctor of Philosophy in Nursing. According to CNNMoney.com, the yearly cost of attending the University of Texas at Austin is $9,790 for in-state students and $32,500 for out-of-state students. The Austing nursing school has a four year graduation rate of 51% and 49% of students have received some type of scholarships or grants. Austin Community College is another nursing school in Austin individuals may want to consider. It’s a huge school in terms of enrollment, with more than 40,000 students. It offers a big college atmosphere that many people tend to enjoy. Those that would prefer a smaller, school may want to consider their other options. Austin Community College’s offers dual nursing programs. The first is a Vocational Nursing Certificate program. Individuals that complete it will become licensed vocational nurses (LVNs), also known as LPNs (licensed practical nurses) in other state except Texas and California. This is a 44 hour program that will prepare students for their licensing exams. The Associate of Applied Science in Nursing is the school’s other nursing program. Individuals that complete it can take the NCLEX-RN exam and upon passing, start working as an RN. Another option is to continue on and earn an accelerated bachelor’s degree at Texas Tech University, thanks to a special partnership between the schools. According to CNNMoney.com, the annual cost to attend Austin Community College is $4,980 for in-state students and $8,640 for out-of-state students. In the end, choosing the right Austin nursing school for you really depends on your educational goals and budget. Obviously Austin Community College is going to be much more cost effective than the University of Texas at Austin. One idea is to start out by getting your LVN certification or associates degree and then continue your education after you start working. 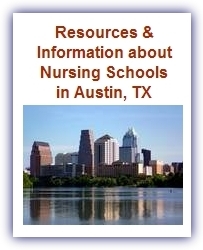 Many nursing schools in Austin, Texas have great LVN to RN and RN to BSN programs for existing nurses.